Change set attached for a minimal implementation. Then Etoys related methods may be pushed down to EtoysPasteUpMorph. using a test Etoys project dropped onto the desktop. loadable and unloadable in trunk." > "ProjectViewMorph openOn: EtoysProject new"
> Change set attached for a minimal implementation. > should not be hard to do. > Then Etoys related methods may be pushed down to EtoysPasteUpMorph. > using a test Etoys project dropped onto the desktop. > loadable and unloadable in trunk." >> "ProjectViewMorph openOn: EtoysProject new"
>> Change set attached for a minimal implementation. >> should not be hard to do. And then later: Rename PasteUpMorph to WorldMorph, and keep an empty PasteUpMorph subclass around for compatibility reasons. So many ideas have been ported down to Morph class over the past years. New applications have no reason to ever use other instances of PasteUpMorph. > And then later: Rename PasteUpMorph to WorldMorph, and keep an empty PasteUpMorph subclass around for compatibility reasons. So many ideas have been ported down to Morph class over the past years. New applications have no reason to ever use other instances of PasteUpMorph. Except for Background images, gridding, drag-and-drop helpers, etc. It should rather be a PlayField (as it comment already states). Also, be wary of the "rename then subclass" deprecation, because if certain projects extend the deprecated subclass (And a lot do for PasteUpMorph), those extensions will never be used in typical circumstances. >> > Then Etoys related methods may be pushed down to EtoysPasteUpMorph. >> See screen shot attached. >> > configuration separate . >> > using a test Etoys project dropped onto the desktop. >> > loadable and unloadable in trunk." >> >> standalone Etoys image. >> >> "ProjectViewMorph openOn: EtoysProject new"
>> >> Change set attached for a minimal implementation. >> >> should not be hard to do. >> no reason to ever use other instances of PasteUpMorph. > Except for Background images, gridding, drag-and-drop helpers, etc. > It should rather be a PlayField (as it comment already states). PlayField? I do not find a class named 'PlayField' in a current Trunk image. Which class do you mean? > those extensions will never be used in typical circumstances. >>> > Then Etoys related methods may be pushed down to EtoysPasteUpMorph. >>> See screen shot attached. >>> > configuration separate . >>> > using a test Etoys project dropped onto the desktop. >>> > loadable and unloadable in trunk." >>> >> standalone Etoys image. >>> >> "ProjectViewMorph openOn: EtoysProject new"
>>> >> Change set attached for a minimal implementation. >>> >> should not be hard to do. 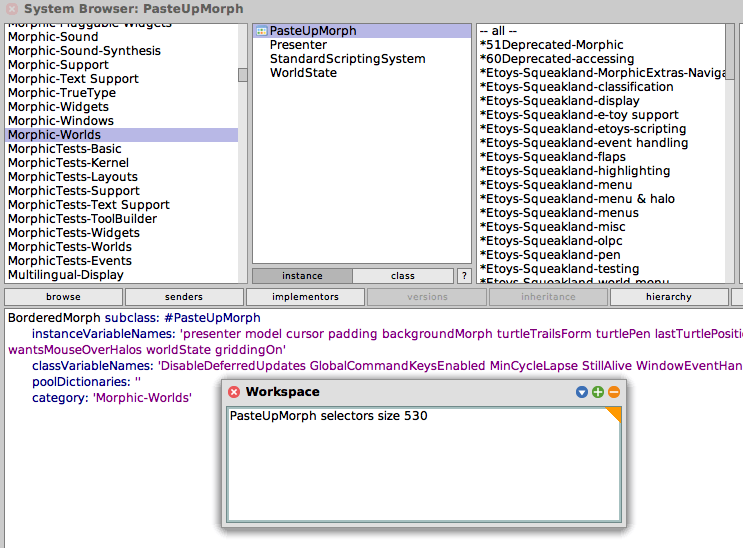 EtoysMorph "keeps Etoys specific messages"
PasteUpMorph "empty PasteUpMorph class for compatibility"
EtoysPasteUpMorph "keeps Etoys specific messages"
>>> no reason to ever use other instances of PasteUpMorph. >> Except for Background images, gridding, drag-and-drop helpers, etc. >> It should rather be a PlayField (as it comment already states). > Which class do you mean? >> those extensions will never be used in typical circumstances. >>>> > Then Etoys related methods may be pushed down to EtoysPasteUpMorph. >>>> See screen shot attached. >>>> > configuration separate . >>>> > using a test Etoys project dropped onto the desktop. >>>> > loadable and unloadable in trunk." >>>> >> An EtoysProject is a project that is configured for running Etoys. >>>> >> standalone Etoys image. >>>> >> "ProjectViewMorph openOn: EtoysProject new"
>>>> >> Change set attached for a minimal implementation. >>>> >> should not be hard to do. I do not think that it is worth supporting existing code that relies on "PasteUpMorph allInstances" to work in its current form. Same for "ContextPart allInstances". > Morph base class (gridding? ), we could add an additional "Playfield", too. > EtoysMorph "keeps Etoys specific messages"
> PasteUpMorph "empty PasteUpMorph class for compatibility"
> EtoysPasteUpMorph "keeps Etoys specific messages"
>>>> no reason to ever use other instances of PasteUpMorph. >>> Except for Background images, gridding, drag-and-drop helpers, etc. >>> It should rather be a PlayField (as it comment already states). >> Which class do you mean? >>> those extensions will never be used in typical circumstances. >>>>> > Then Etoys related methods may be pushed down to EtoysPasteUpMorph. >>>>> See screen shot attached. >>>>> > configuration separate . >>>>> > using a test Etoys project dropped onto the desktop. >>>>> > loadable and unloadable in trunk." >>>>> >> An EtoysProject is a project that is configured for running Etoys. >>>>> >> standalone Etoys image. >>>>> >> "ProjectViewMorph openOn: EtoysProject new"
>>>>> >> Change set attached for a minimal implementation. >>>>> >> should not be hard to do. gridding and drag and drop behaviour shifted up from PasteUpMorph. > Yes, I am fine with this. >> EtoysMorph "keeps Etoys specific messages"
>> PasteUpMorph "empty PasteUpMorph class for compatibility"
>> EtoysPasteUpMorph "keeps Etoys specific messages"
>>>>> no reason to ever use other instances of PasteUpMorph. >>>> Except for Background images, gridding, drag-and-drop helpers, etc. >>>> It should rather be a PlayField (as it comment already states). >>> Which class do you mean? >>>> those extensions will never be used in typical circumstances. >>>>>> > Then Etoys related methods may be pushed down to EtoysPasteUpMorph. >>>>>> See screen shot attached. >>>>>> > configuration separate . >>>>>> > using a test Etoys project dropped onto the desktop. >>>>>> > loadable and unloadable in trunk." >>>>>> >> An EtoysProject is a project that is configured for running Etoys. >>>>>> >> standalone Etoys image. >>>>>> >> "ProjectViewMorph openOn: EtoysProject new"
>>>>>> >> Change set attached for a minimal implementation. >>>>>> >> should not be hard to do. > PlayField? I do not find a class named 'PlayField' in a current Trunk image. "A morph whose submorphs comprise a paste-up of rectangular subparts which "show through". Anything called a 'Playfield' is a PasteUpMorph." >>>>> Then Etoys related methods may be pushed down to EtoysPasteUpMorph. >>>>> using a test Etoys project dropped onto the desktop. >>>>> loadable and unloadable in trunk." >>>>>> "ProjectViewMorph openOn: EtoysProject new"
>>>>>> Change set attached for a minimal implementation. >>>>>> should not be hard to do. Thank you for the clarification, Tobias. and push all the *Etoys related methods down to EtoysPasteUpMorph. "Initialize a new Morphic Project"
world := PasteUpMorph newWorldForProject: self. world := EtoysPasteUpMorph newWorldForProject: self. world := self class defaultPasteUpMorphClass newWorldForProject: self. > "show through". Anything called a 'Playfield' is a PasteUpMorph." >>>>>> Then Etoys related methods may be pushed down to EtoysPasteUpMorph. >>>>>> using a test Etoys project dropped onto the desktop. >>>>>> loadable and unloadable in trunk." >>>>>>> "ProjectViewMorph openOn: EtoysProject new"
>>>>>>> Change set attached for a minimal implementation. >>>>>>> should not be hard to do. I put my initial change set on SqueakSource at http://www.squeaksource.com/EtoysProject. anything that you thimk makes sense. to merge back into Etoys in trunk when it is ready. Etoys work should be restored so that the other projects are not affected. > Thank you for the clarification, Tobias. > and push all the *Etoys related methods down to EtoysPasteUpMorph. > "Initialize a new Morphic Project"
> world := PasteUpMorph newWorldForProject: self. > Locale switchToID: CurrentProject localeID. > world := EtoysPasteUpMorph newWorldForProject: self. > world := self class defaultPasteUpMorphClass newWorldForProject: self. > >>>> no reason to ever use other instances of PasteUpMorph. > >>> Except for Background images, gridding, drag-and-drop helpers, etc. > >>> It should rather be a PlayField (as it comment already states). > >> Which class do you mean? > > "show through". Anything called a 'Playfield' is a PasteUpMorph." > >>> those extensions will never be used in typical circumstances. > >>>>>> Then Etoys related methods may be pushed down to EtoysPasteUpMorph. > >>>>> See screen shot attached. > >>>>>> configuration separate . > >>>>>> using a test Etoys project dropped onto the desktop. > >>>>>> loadable and unloadable in trunk." > >>>>>>> standalone Etoys image. > >>>>>>> "ProjectViewMorph openOn: EtoysProject new"
> >>>>>>> Change set attached for a minimal implementation. > >>>>>>> should not be hard to do. that account so that you will be able to use your own "mt" for updates. I'm not sure anybody uses Etoys anymore, but PasteUpMorph is very useful in direct manipulation because of it's various layout and event handling options. It also act as a container of other morphs, with automatic layout, enumeration etc. 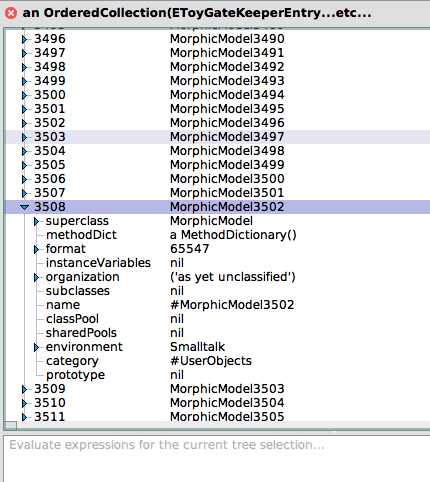 I'm sure most of this could be refactored into Morph class or another class. PasteUpMorph is useful and the functions have to be maintained. However adding more functions to Morph does not make sense. So far entering and existing the Etoys project works smoothly. The issue is about providing more settings when entering. Karl, do you want to be added to the list of developers? > PasteUpMorph is useful and the functions have to be maintained. > However adding more functions to Morph does not make sense. > So far entering and existing the Etoys project works smoothly. > The issue is about providing more settings when entering. > Karl, do you want to be added to the list of developers? > > PasteUpMorph is useful and the functions have to be maintained. > > However adding more functions to Morph does not make sense. > >> layout, enumeration etc. > >>> no reason to ever use other instances of PasteUpMorph. > >>> > Then Etoys related methods may be pushed down to EtoysPasteUpMorph. > >>> See screen shot attached. > >>> > configuration separate . > >>> > using a test Etoys project dropped onto the desktop. > >>> > loadable and unloadable in trunk." > >>> >> standalone Etoys image. > >>> >> previous values. > >>> >> "ProjectViewMorph openOn: EtoysProject new"
> >>> >> Change set attached for a minimal implementation. > >>> >> should not be hard to do. ProjectEtoys. It did not work. >> So far entering and existing the Etoys project works smoothly. >> The issue is about providing more settings when entering. >> Karl, do you want to be added to the list of developers? >> > PasteUpMorph is useful and the functions have to be maintained. >> > However adding more functions to Morph does not make sense. >> >> layout, enumeration etc. >> >>> no reason to ever use other instances of PasteUpMorph. >> >>> > Then Etoys related methods may be pushed down to EtoysPasteUpMorph. >> >>> See screen shot attached. >> >>> > configuration separate . >> >>> > using a test Etoys project dropped onto the desktop. >> >>> > loadable and unloadable in trunk." >> >>> >> An EtoysProject is a project that is configured for running Etoys. >> >>> >> standalone Etoys image. >> >>> >> previous values. >> >>> >> "ProjectViewMorph openOn: EtoysProject new"
>> >>> >> Change set attached for a minimal implementation. >> >>> >> should not be hard to do.